Kayaking offers a pleasurable experience to everyone who picks an interest in it. Making use of a paddle kayak or pedal powered kayak is what differentiates the pleasure of your experience. While paddle kayaks have gained widespread use, the pedal kayak offers itself has a more flexible and pleasurable kayaking time. The pedal propelled kayak is relatively wide, comfortable and easy to use. It fits in well for beginners and professionals giving kayaking a whole new meaning. The best pedal kayaks offer the best kayaking experience with outstanding features and impressive specifications. But what is the best pedal kayak? How do you choose a cheap pedal kayak? All these and many more is what we will be examining in this review. With a relatively new design and more interesting colors, pedal kayaks have established themselves as better propellers. With the pedal kayak, you are able to do more than just own a kayak. However, knowing why you should buy pedal kayak is very important to buy one. It is very comfortable to use in that with a pedal kayak, you can make use of your largest muscle group to ride while your legs power the kayak as it moves. This helps to reduce your arms and shoulders from getting all stressed and cramped while making use of the kayak. As much as those with strength want to paddle a kayak, the pedal kayak still offers room for others as well. The versatility of the pedal kayak is yet still another reason why you should buy it. Anglers and everyone alike are able to make use of the pedal kayaks and enjoy the many advantages that come with using one. Generally, the length and storage capacity of pedal kayaks makes it good for fishing as baits, hooks, tackles and other fishing materials can be stored in it. Also, the pedal kayak allows for you to have your hands available for many fishing activities while it is being paddled with your legs. As your legs gradually paddle the kayak, you can make use of your hands to cast in your net into the water and watch the fishes sink in. In doing this, you don't have to worry about the stability of the kayak. You also don't need a paddle to have you secured or avoid being dropped in the water. In terms of size, pedal kayaks still stand out from other kayaks in that they are a bit wider than other types. The wideness of the pedal kayaks makes them more stable to use as they stand firm not tilting to one side as you have with other non-pedal kayaks. The seating structure of the pedal kayaks is also one good reason why you should buy one. They come with very comfortable seats that offer adjustments and upgrade after a while of use. As much as the pedal kayak comes in various types and forms, so does its propulsion. The propulsion types of pedal kayaks differ from one another and this difference is based on the operation for which it is needed for a fishing kayak with pedals might not necessarily be what will be needed for another type of pedal kayak. However, generally speaking, there are two major types of propulsion which we will be examining, looking at the operation for which they are suitable. These two types of propulsion are the push pedals and the rotational pedals. While they have both been said to be easy to use the pedal, the only difference that exists between both propulsion is the body motion required to operate both. Pedal kayaks that have the push pedal propulsion are moved forward or backward by different body motion. To push such kayak, you will need to push your feet forward or backward causing the kayak to either move forward or backward. What this means is that the more you push the kayak, the more it moves. Movement of the kayak stops as soon as you stop pushing the kayak. This is what brings us to the disadvantage of this propulsion which is that it requires a whole lot of momentum and energy to be exerted for it to move and keep moving. Kayaks with rotational pedals, on the other hand, are moved like in a walking motion. The kayak is being rotated with the legs continuously. It comes with a rotational paddle that is being used to gather momentum around the kayak as it is being continually moved in a walking motion with the legs. Because the kayak after a long while has gathered a lot of momentum, it is still likely to keep moving even after you stop pedaling it. So when you stop pedaling, the kayak still moves at a speed that gradually drops until after a while of movement if no longer pedaled, the kayak comes to a halt. While this propulsion enhances speed, it requires a whole lot of space for efficiency. This best pedal kayaks guide has been put together so as to aids people decision of the best pedal kayaks to buy and also know why they are buying it. This review looks to be one of the most referenced reviews that will inform users of the kayaks so they can make the best decision as regards pedal kayaks. It is on this premise that we began in-depth research as to what the best pedal kayaks are, the features they possess and other specifications. In this quest of ours, we were able to gather a number of volunteers from all around who offered us other research papers. They were also able to share their knowledge with us about pedal kayaks and gave us good personal usage examples. They analyzed the individual structure in terms of designs and features of each pedal kayaks they have used. We were also able to know some of the strengths and weaknesses of a number of these pedal kayaks from them. We also sort for the help of manufacturers and experts as well. We listened to their opinions and analysis of each of the pedal kayaks we have provided in this review. To be sure that we are right with our analysis, we let out a poll on these manufacturers and experts as to the order of arrangement as well. It is on their opinions that we also arrived at these top 10 list of ours. With all the necessary in for me gathered, we screened through and reviewed over time what we had especially taken into consideration the modern trend. We also considered the place of technological advancements on this modern world and how it affects the pedal kayaks as well. This is a tested and trusted review and one that we are certain is the best you can find anywhere on the Internet about pedal kayaks. We are also certain that this best pedal kayaks review is a good guide for those looking for the best pedal kayaks for beginners as well as the best-rated pedal kayak. Everyone who wants to buy a pedal kayak has a different reason for doing so. This is why beyond being informed about what the best value pedal kayak is, you also have to know what purpose you need a kayak for. When the purpose for which a kayak is needed has already been established, then there are certain things to consider when buying the best budget pedal kayak. Though numerous, we shall be looking at the basic factors to consider when buying a pedal kayak if you want to buy the best pedal kayak for the money. Stability is the ability of the pedal kayak to be purchased to stand firm and fit for the purpose. While pedal kayaks generally are known to be more firm and stable than other kayak types, the stability of one pedal kayak differs from that of another pedal kayak. Kayaks that you pedal especially for fishing purposes should be stable allowing you to make use of your hands for other fishing activities. You should be able to pedal a kayak without any fear of falling off in the process. The speed of the pedal kayak is also a factor to consider when choosing a pedal kayak. How fast can the pedal kayak move over a given period? This also depends on the purpose for which the kayak is obtained. Fishing kayak with pedals should offer you more speed than kayaks with foot pedals. This is where the propulsion of the kayak also comes to play. Remember that kayaks with rotational pedals are more likely to offer better speed than those with push pedals. The capacity of a pedal kayak explains its size and storage. If you need a kayak for fishing, then it is very important that you go for one that is wide and has large storage capacity. With this, you will be able to store your fishing materials in them and also be able to pedal easily and in a more comfortable way. The material and durability of the pedal kayak is a factor to be considered as well. Make sure to go for a pedal kayak that is made of quality materials. A pedal kayak made of quality material is bound to last longer than one made from less quality material. The durability of the pedal kayak should also be taken into consideration so as to save yourself the cost of timely maintenance. While many experts are of the view that the paddle kayaks have better tracking and turning abilities than the pedal kayaks, this might not be so. The relative size and space if the pedal kayaks have largely improved its tracking and turning abilities. Make sure to go for pedal kayaks that are a bit wider have better hull sizes. The pedal kayak comes in various sizes and shapes all carrying out similar purpose. So consider a shape you like best and a size that you will comfortable pedaling in. Don’t go for large-sized pedal kayaks that you won’t be comfortable in. A portably sized pedal kayak that fits the purpose you need it for will offer you a lot more fun and effectiveness. Pedal kayaks differ from themselves in terms of seating and transport structure. These two are largely defined by the size of the pedal kayak in question. The larger the size of the pedal kayak, the more seating option likely to be available. Similar to what is obtainable with other kayaks, the launching and beaching make it easy for the pedal kayak to be driven inside water. It is possible that you go for a compact pedal kayak when getting one. However, you can make use of a secondary propeller if your pedal kayak has a poor launching and beaching ability. Glad for a pedal kayak that is compatible with other accessories. The beauty of fishing with a 2 person kayak with pedals is that it is compatible with other accessories that make it comfortable for both parties. The price is a factor to be considered when buying pedal kayaks. Make sure you have a budget prepared beforehand and check for the price to quality ratio of each pedal kayak to be sure you are getting the quality at the price and for the purpose, it is needed. We previously discuss that we have categorized our top picks according to the type they belong to and after analyzing their basic factors (discussed in the section ‘what to look for…’) so that you may find which specific product or any kind of product you need. Coming first in this ranking of ours is the Perception Pescador Pilot Pedal Drive Kayak. Known for its relative comfort, stability, and safety, this pedal kayak is best anyone can possess. Absolutely Comfortable: Considering how you will be operating on water, a pedal kayak that offers utmost comfort is no doubt one that is needed. With a well-designed structure and feel, this pedal kayak is the most suitable option for utmost comfortability. It comes with a removable captain chair and a good seating arrangement with a zonal mesh that allows for cool air flow into the kayak. Its adjustable seats also enhance its comfort by making it easy to slide it back and forth as you pedal the kayak with your legs. This makes it a good kayak for fishing. A Very Stable Pedal Kayak: With the stability of the pedal kayak, comes all the confidence that is needed for you to carry out any and every other activity while in the pedal kayak. This beautifully structured pedal kayak offers that stability that instills confidence. It comes with very smooth hull tracks that aids staying on course with less effort. It also has a widely spaced cockpit for easy entry, exit and pedaling of the kayak by anyone on board it. Known to be one of the most versatile pedal kayaks available in the market. You need to upgrade your budget if you truly want this pedal kayak. Once you have aligned your purpose with your budget, then nothing should be stopping you from getting this pedal kayak. Like our top pick, we are sure it is one that will offer you all that is desired of a pedal kayak. Fishing, distance traveling, and kayaking as a whole feel better when you make use of the best pedal kayak. To us, no other pedal kayak beats this in terms of design and functionality. 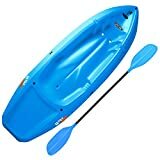 When you are considering a very portable pedal kayak with all the appropriate features and more, then it is no other than this pedal drive solo kayak. Coming with a whole lot of features in a relatively small size, this pedal kayak is a must have for fishermen and distance traveler. Its amazing features and compact nature stands it out among other pedal kayaks. Good seating structure: One high point of this pedal kayak is its seating structure. It comes with a roto molded hull that is streamlined and has been made resistant to UV. This makes it easy for you to sit in this pedal kayak and be shielded from the sun ray over extended periods. Also, these seats have been well placed so much so that it doesn't interfere with entering in OR going out from the kayak. Relatively Compact Structure: Designed to come handy and compact, this pedal kayak is easily movable from one place to another. Not only does its compact design allows for it to be moved, but it also makes it easy for the kayak to cut through and meander its way through water bodies easily. The easy movement of this kayak across water bodies makes it a more pleasurable kayak. Highly Efficient Propeller Type: Though coming in a compact design, this kayak comes with a very efficient propeller type. This makes pedaling very easy for you as you don't have to exert a lot of energy. The good side if the efficiency of this kayak's propellers is that it comes with straps that secure your feet while pedaling even if they are wet. It comes with a hull a weight of about 60-80 lbs. It has a maximum load capacity of about 420 lbs. Its stiff drive challenge remains a major problem. It is a bit hard to stand. Budgeting is key to making a good purchase but shouldn't limit the quality to be served with. So if you are thinking of working within a reasonable budget but still keeping in touch with a high performing pedal kayak, then this is for you. Not only will you enjoy a good price to quality ratio, but you will also find pedaling a more interesting experience than you have at any other point in your life. Occupying the number 3 position in this top 10 pedal kayak ranking of ours is the Native Watercraft Slayer 13 Propel Kayak. This pedal kayak makes it here because of its being an ultimate hands-free fishing machine. Widely used among fishermen who look to combine pleasure and profession together, this pedal kayak is an outstanding one. Improved Storage Capacity: Fishermen always have a whole lot item with them ranging from their nets, hooks, to theirs baits. All these materials need to be stored. In order to ensure easy storage while in use, this pedal kayak comes with an impressive and more improved storage capacity than other pedal kayaks. The storage of this pedal kayak is also well secured on both ends with an iron throttle. Amazing turning and tracking: The relative sizes of this pedal kayak makes it one with a very good turning and tracking ability. This makes it a good pedal kayak for beginners who have really not mastered kayaking. It is very easy to use and understand and does not require any extra stress. Good price value to the quality ratio: No matter how buoyant you are as a person, it is frustrating when you have to spend a lot on a tool and find out it works far below what is expected of it. This is not the case with this pedal kayak as reviews and ratings from customers validate its price to be equal to the quality of its performance. Offers a reverse pedaling mechanism not provided for by any other pedal kayak. Comes with an uncluttered flat deck area that assures comfortability. Has open bow storage for safekeeping accessories. Has better and more improved tracking abilities than most pedal kayaks. Comes with a high-quality captain chair hands. Servicing requires a special toolkit. A lot can be done to improve the rudder design. Pleasure and profession can be combined together and only this pedal kayak can help you achieve that. Giving you the comfort, stability, and efficiency needed while fishing, you also enjoy the ample storage space of this pedal kayak. How about the impressive tracking, turning and rudder quality of this pedal kayak? You can't have enough of this pedal kayak which is why you should try it out for yourself. Far traveling abilities: Asides from being known for the space it offers, this pedal kayak is also known for its excellent travel abilities. As a foot kayak, you are able to cover long distances in a little while. With a rotational pedal, the kayak gathers a lot of momentum that still keeps it going even when no energy is exerted to it. This way you are able to relax after a long while of pedaling while still having the kayak move at an appreciable speed. Amazing pedal drive system: The pedal drive system of this foot kayak is amazing and only a few pedal kayak available in the market today matches this standard. It comes with a pedal-driven propeller system that allows the kayak to move better and faster with less stress required to keep it going. Additionally, it also allows for trolling motor to be attached to enhance its speed. Good also for fishing: The speed, relativity in the ease of use and the high-level stability all combine it to make it a pedal kayak that is fit and good for fishing. Fishermen are able to enjoy fishing on a new and more pleasurable level when they go fishing with this pedal kayak. Excellent comfort and stability: Streamlined with bow molded hulls, this pedal has all the balance it needs to assure the user the most stable kayaking experience. It comes with stable handles that make it easy for you to navigate the pedal kayak through water bodies as you move. When empty, it has a hull weight of about 80 lbs. Has a maximum load capacity of about 550 lbs. Allow for other compartments like trolling motor to be added. It comes with ample storage space that is safe and secured altogether. With all being said, you are left to make a choice to either go with the best foot kayak available in the market or settle for one of the many options. This one of a kind foot pedal kayak is so affordable yet still very much reliable. To enjoy fishing or long distance traveling is to get this well-designed foot pedal kayak. The Hobie Mirage Outfitter Tandem Kayak is our number 5 pick in this top 10 list and this is largely due to its being a fun-filled machine. With the right specifications in place and all attachments secured, this pedal kayak is a very affordable one with an impressive price to quality ratio, especially when compared in capabilities to other pedal kayaks. Simple design, easy to use: The selling point of this pedal kayak remains its simple design. This pedal kayak unlike many others pedal kayak of its kind come in a very simple design but still very compact not lacking any of the specifications needed for it to function effectively. With this simplicity of design comes to ease of use. Users are able to understand the various parts of this pedal kayak and how these parts can function effectively. Allows for hands-free propulsion: The ease of propulsion is one of the factors to be considered when getting a pedal kayak. With this pedal kayak, you are able to enjoy hands-free propulsion. What this means is that you can freely and comfortably pedal the kayak with your legs while you make use of your hands for other activities. For fishermen, this is best because your hands can be used to carry out other fishing activities of yours while your legs do the pedaling. Adequate structure to keep it firm and in place: This pedal kayak amongst other things comes with inbuilt drink holders and utility trays that make up structural contents of the kayak. It also comes with a mast step that ensures the legs of this kayak stands firm. It also comes with a wide beam, an impressive length and has a comfortable platform, all of these to secure the comfort of the user while pedaling the kayak. It is made of the polyethylene material which makes it resistant to corrosion. It is a bit heavy in weight and not the best for offshore. If you seek to possess one of the best onshore pedal kayaks, then this should be the first to come to mind. With a good design any pedal kayak can have, long-lasting material quality and high performance, this is most recommended for fishermen. The 6th pedal kayak on this ranking of ours, is the Native Watercraft Slayer 10 Propel Pedal Fishing Kayak. This fishing pedal kayak is as very light 10" pedal drive and one of the lightest you will find in the market. Though being very light, this pedal kayak is not found wanting in its features and specifications. It is also known to be a high performing pedal kayak widely desired by fishermen. Excellent and rock-solid stability: Stability is everything to be considered by anyone choosing any pedal kayak especially when it is to be used for fishing. This is because you will need to be assured that you and whatever is carrying you are stable enough to give you all the concentration needed to carry on fishing. Though coming in a very lightweight, this pedal kayak still offers excellent and rock-solid stability while pedaling it with your legs. Clutter-free and easily accessible cockpit: This pedal kayak among other things also comes with a clutter-free cockpit that allows for the captain to pedal the kayak without necessarily interfering with movement in and out of the kayak. This not only makes the cockpit accessible but the kayak itself as a whole. Excellent bow to stern rail mounts: The excellent bow to stern rail mounts of this pedal kayak allows you to relax and probably sip a beverage or catch a glimpse of nature's best flight in the air or amazing water tides. It also allows for the rod holders to be put on and off easily. Speedy movement and high maneuvering abilities: The lightness of this fishing pedal kayak manifest itself more in its speed and ability to maneuver its way through water bodies. The lighter the weight of a pedal kayak, the faster it is likely to move to make this pedal kayak one if the fastest available in the market today. It becomes stable to use after it has been mastered. If you are looking for a personal kayak that can offer you comfort and speed altogether, then you should go for this lightweight fishing pedal kayak. With all of these amazing features, it comes at such an affordable price one that offers the quality you desire from a pedal kayak. Read more reviews and ratings to find out what other people are saying about this pedal kayak. Easy to use, store and maintain: Being an upgraded pedal kayak, this 2019 model of the Hobie mirage is a lot more easy to use. Its many complex features have been simplified making it very easy to understand even by beginners who are yet to very well master kayaking. Asides from being easy to use, it is also very easy to store as it comes in a very compact design with all the necessary features firm and in place. It is a more versatile option in terms of compatibility: The compatibility of a pedal kayak is a very important factor to consider when getting one. This pedal kayak is a more versatile option in terms of compatibility. It works well with paddles, motor trolling and other attachments needed for the pedal kayak to function effectively. It has good seating and transport systems: The seating and transport system of this pedal kayak is also a notable feature. It has well-spaced seats that allows for easy entrance and exit while providing all the necessary comfort needed while pedaling. Comes with a hull weight of about 65 – 80 lbs. Comes with dry bags to help keep your items from getting soaked in water. With your budget already planned, and the purpose for which you need a pedal kayak, this is a good kayak to try. Like a fisherman, a distance traveler or one who just loves kayaking, this is easy to use one. The pedal power of the Malibu Pedal Kayak remains the most talked about feature of this kayak. Known to come handy, these pedals are easy to use and relatively comfortable. They do not require any stress and can be effected with your legs while your hands work freely. This increase the level of productivity that can be attained when this pedal is used for whatever purpose you desire it for. However, asides this, this pedal kayak still possess some amazing features. Adjustable and Comfortable Seat Options: This pedal kayak comes with a seating option that can accommodate you the user as well as a small child or your pet. Designed in a way that the entry and exit from the pedal kayak aren't interfered with, you can adjust the seat options to make it more comfortable for whoever is going into it. Perfect Pairing Abilities: The perfect pairing ability of this pedal kayak is also one feature that cannot be overlooked. It is a more compatible pedal kayak than others and works well with other compartments making it very versatile in use and in function. Has bench seats with mesh storage pockets wide enough to accommodate a number of items. It has a low deck profile and good storage that aids better performance. A number of its features are adjustable making them more comfortable. They are not just weighty, they are also very expensive in terms of the price they come as against the quality they deliver. For a flexible, versatile and comfortable pedal kayak, this the most suitable. There is no limitation on who can use as much as there isn't for the purpose it can be used for. Provided you have the budget to land yourself this awesome masterpiece, then there is no second guessing about it. It is worth the purchase long as adequate maintenance mechanisms are being put in place. Are you looking for a tandem fishing kayak with twin pedal drive? Then you should go Got the amazing BKC UG-PK14 pedal drive kayak. With this drive, you are able to do a lot as a fisherman and much more as a long distance traveler. With amazing features and product specifications, this pedal kayak makes it to the number 9 spot on this top 10 ranking of ours. Best Friend Covering Long Distances: Being a pedal kayak that offers twin pedal drive, you are able to make use of this kayak to cover longer distances that you will with any other pedal kayak. Not only will you be able to cover long distances, with this pedal kayak, but you are also able to do that at a faster speed getting to your destination faster than expected. Asides Speed, It is Stable: Not only has this pedal kayak been designed for speed, but it is also known to be a very stable pedal kayak. Offering just one paddler, you do not have to worry as it can be maneuvering around waterways without fear of it falling off or tilting to any side. To affirm its stability, it is designed with a watertight hatch and a bit large in size so as to be firm on the water body. Offers a reasonable amount of space: Space being a major factor to be considered when choosing a pedal kayak is taken into consideration by the manufacturers of this pedal kayak. It offers ample space to store fishing materials, with little security put in place to ensure items stored are safe. Has a weight of about 99 lbs. It has ample space for items and goods to be stored. Doesn't come with paddles so you would need to get them separately. Quite heavy in size as a lot can be done to make it portable. Nothing is more interesting than going for a much more flexible innovation especially when it has to do with kayaking. Being the first of its kind that offers a twin pedal drive, you are sure it is the best of its kind. Enjoy the flexibility this twin pedal drive alongside the space, comfort, and stability it has to offer by purchasing one for yourself today. 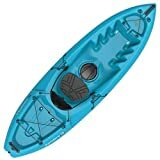 The last but not the least pedal kayak on this top 10 best pedal kayaks list of ours, is the Hobie Mirage Revolution 11 Kayak Caribbean Blue Kayak. This pedal kayak enjoys as much as the brands that produce it enjoys in terms of quality and excellence. Common among beginners ad a few professionals it offers a number of amazing features just like other pedal kayaks. Easy to understand, use and maintain: This pedal kayak, unlike many another pedal kayak, unlike many another pedal kayak, is very simple to understand and a little knowledge of kayaking is all that is needed to be able to make use of this pedal kayak. This is probably why it is a much more preferred kayak amongst beginners than it is among professional. Asides from being way easy to use, this kayak is also very easy to maintain making it very durable. 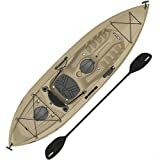 Good tracking, turning and running features: In terms of tracking and turning, this kayak is as good as every other kayak out there as it has in place and fi m every feature that makes tracking and tuning possible. Its top-notch rudders also make it very easy for it to navigate and make its way easily through water bodies without losing balance. Strong material, impressive hull size, and shape: The material build-up of a pedal kayak determines its durability or otherwise. Made from the polyethylene material, this pedal kayak can last for as long as it is maintained. Its full size and shape also leave much to be desired from it as it establishes it as a pedal kayak that is also suitable for fishing. Its storage spaces have dry bags to prevent items stored from getting wet. A lot can be done to improve the storage compartments. This pedal kayak review will not be complete if nothing is measured about maintaining pedal kayaks. Maintenance is the major one to not only keep the pedal kayak in the best working condition, but it also helps to save the cost timely breakdown might incur. There are a number of ways to maintain the pedal kayak, but let us run through some of the basic things to note when caring for and maintaining a pedal kayak. Clean the pedal kayak after every use: As soon as you are done making use of the pedal kayak, the best thing is to have it cleaned up. Take away every dirt and material from it and ensure it is in the best condition for the next time it will be used. Check to be sure all attachments are in place: After every use, make sure you check the pedal kayak and be sure that all attachments are secured in their place. Also, make sure there are no leakages or breakage, and if you find any, you should fix it immediately. Avoid sharp objects from coming in contact with the pedal kayak: Make sure that the pedal kayak is stored in a very secure place after every use. Keep it from coming in contact with any sharp object that may scratch or dent it. Avoid making use of the pedal kayak at night: Except adequate lightning facilities have been put in place, you should avoid making use of the pedal kayak at night. Make sure to stick with the manufacturer’s guide: Many users fail to understand that the pedal kayak differs from themselves especially because they come from different brands. Paying attention to the manufacturer guide that comes with each kayak offers you better information about the pedal kayak and its usage. Don’t neglect pedal kayak safety precautions: Be it a beginner or professional, safety precautions are very important for you when making use of pedal kayaks. Make sure to keep yourself safe and free from accidents by complying with every precaution provided while using pedal kayaks. It is fun and advantageous to own a pedal-propelled kayak as you will enjoy kayaking on an entirely different and new level. Pedal-powered kayaks enhance fishing making it much easier, more comfortable and also very productive. With all of the knowledge of getting a pedal kayak, how to maintain and use one already provided, you might ask if there is anything else you need. Yes, a life jacket and some dry bags can be some additional requirements to ensure your kayaking experience is more pleasurable. While the dry bag offers you additional storage options, the life jacket is a life saver. Remember you are working on water and anything can happen. In order to ensure you are safe when an unforeseen incident happens, a life jacket can keep you alive. This best pedal kayaks review has no doubt provided all that is needed to guide you when choosing a pedal kayak. With the pedal kayak comparison provided, and factors to take note when buying one, you are sure to be able to select the best pedal kayak for whatever purpose you need it for. Don't forget to pay attention to the price ratio and take note of the tips provided to care for and maintain a pedal kayak. You can find out more about pedal kayaks by reading reviews and ratings of customers who have used any of the pedal kayaks. Also, you can leave a review after you might have purchased and used one.